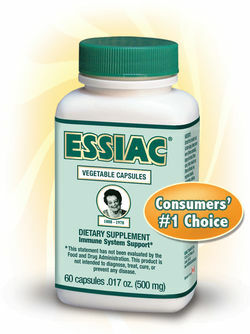 ESSIAC® is an herbal formula which helps support the immune system*. Regular users may want to consider using the ESSIAC® program as guidance to ensure that a consistent regime is followed. Below are the daily suggested amounts, should you choose to follow the program. One bottle will last 1-2 weeks, depending on the daily intake. Each bottle contains 60 capsules (500 mg).